The guitar market is saturated with an array of models suited to different situations and needs. The idea is to offer a solution to every possible instance in which a guitar may be required. Some are catered towards specific groups of people, like children or beginners, whilst others take on a more practical application such as electro acoustic guitars, which balance the need for an acoustic instrument that can be amplified and still keep the natural overtones usually associated with the instrument. In this guide, we cover travel guitars, a growing trend as more and more people opt to travel and wish to take their beloved instruments along with them. The idea is that these people do not want to take a full sized regular version with them for fear of it being impractical and being bothersome when having to adhere to strict luggage requirements. Or worse, seeing it damaged, broken and lost in transit. This is particularly relevant for top of the line guitars that cost an arm and a leg. As a solution to this very modern predicament, the travel guitar has risen as the go to guitar. It allows people the benefits of portability, the ability to keep up their playing while away and ensuring that their main instrument remains at home, safe from the tribulations of international travel and the impact of different environments on wood and electronic components. Within the travel guitar category there are models for every budget and level, from professional models that are suited to performances and lower priced most models for people who just want a guitar to noodle around on whilst lounging on a beach halfway across the world. How does one determine what guitar to buy? There is no simple answer and subjective judgment remains the main factor as with the purchase of any other type of guitar. We hope with this guide to set you on the right path by running through the features that define a travel guitar, offering a list of quality points and listing a number of options that have caught our attention. Essentially, a travel guitar is one made for the open road. It is for people who suffer from an acute case of wanderlust, who are intent on traversing our globe from end to end eager to discover its most hidden secrets and lost locations. It is also for travelling musicians who spend the better part of their working lives hopping from city to city to perform and entertain audiences with their music. Historically, travelling musicians date back centuries with visions of bards charming audience gathered in a brimming taverns across the land. We think of minstrels and troubadours during Medieval times, or blind Ukrainian Kobzar’s crossing the harsh winter to bring join through their songs and liturgies. These artists were burdened with the weight of their instruments, but travelled much more freely, unencumbered by the health and safety demands of modern public transport’s obsession with weight and size. Today, any professional musician has one or two stories describing some horror story involving the rail authorities or a budget airline who seemed intent on either destroying an instrument or making it as difficult as possible to take it on board. The demands are also much more significant nowadays as musicians require an instrument capable of handling the demands of live performance as well as studio environments and the recording booth. In comes the travel guitar, which is loosely defined as a small guitar sporting a reduced size through either a modified or smaller body, short scale or novel disassembling solution such as an easily removable neck. They generally come in ¾ size in terms of the scale length in relation to normal guitars. They are available both as acoustic and electric guitars, with some reaching prices that easily match the cost of their full-sized iterations, though we recommend staying well clear of these as they go against the grain of the true function of a travel guitar. Some even come in travel-ready boxes or rucksacks for ease of use. Rest assured that the same devotion and work ethic on the part of manufacturers goes into travel guitars and they are as qualitatively well-made as any other guitar. The portability doesn’t come at a cost to quality and travel guitars are as playable as normal guitars, and often sound just as good as full-sized competitors in the same price range. The idea here is that it seems counter-intuitive to get a guitar specifically for travelling that doesn’t sound good, has an excessively low volume, or simply doesn’t feel pleasant to play so manufacturers put in the same amount of effort. The simple way to view it is as a small, shorter-scale guitar ideal for travelling. A more practical and laid-back version of the regular guitar. Travel guitars need to be portable. they are smaller than usual or at least are designed to be packed away into a size smaller than a classic guitar. That being said, there are full-sized guitars that are categorized as travel guitars, but are in fact expensive models that won’t fare well during journeys at all. No one wants to cart around such an exquisite gem and risk it being destroyed. This would be a gargantuan waste of money. We therefore recommend looking for true travel guitars that match their small size with a low or, at the very least, a reasonable price. Think disposable, but not too disposable. Another point to look out for with more complex types of travel guitars is whether the way they disassemble is simple and straightforward. Having to tinker around with a complex mechanism when all you want to do is play some music only hampers your enjoyment. Detachable necks need to be simple to attach to the body and models that come with cases must be packed easily without a series of convoluted steps to simply get it back into their protective cases. By their very nature, travel guitars need to be tough and able to handle sitting in a backpack or swinging from shoulders for long periods of time with all the knocks and bruises that this may entail. Also, it must be able to handle being thrown around an airport and inside a plane’s cargo hold without suffering too much damage, or at least only suffer from superficial damage that doesn’t affect the quality of the sound produced. In addition, travel guitars must be able to handle sudden changes in humidity levels and heat, as is the case when often travelling to different climates in quick succession. Wood is particularly sensitive to this changes, but much can be done by builders to counteract their effects, so look for builds that are designed to withstand harsh environmental fluctuations with few significant consequences. The best way to determine this is to get a physical hold on how the guitar feels. It is simple to ascertain if a guitar feels well-built or not. A fragile instrument feels that way and instantly makes you think that you need to protect it from being bashed around. A reliable guitar feels well-built, almost indestructible and manufacturers worthy of their reputation will ensure this is the case. Not only will a strong guitar last longer, your mind will be at ease. Knowing it is stowed away in a luggage compartment away from your attentive eyes, yet is safe is reassuring. There is no risk of you reuniting with it only to find it shattered into multiple pieces or bent to the point that you cannot keep it in tune any longer when playing. The best measure of quality is always the sound or tone of a guitar. Basically, it all comes down to whether or not it sounds good. This is determined mainly by the tonewoods, or variety of wood specifically chosen for guitars to maximize the transmission and natural amplification of sound, and the build. Electrics also play their part when considering electric travel guitars, as do components. The way a guitar is constructed also plays a part and is particularly relevant when considering travel guitars given their need to be strong and able to handle everything thrown at it while on the road as described above. Also of note with travel guitars is the volume level, particularly with acoustic travel guitars. They need to be sufficiently loud that they can be heard by people other than the player themselves. Travel guitars are generally used in convivial setting like a beach party or around a fire on a campsite in a faraway country, so it is important they can be heard to convey their full effect and reach others with the music. Volume is something tangible and is easily tested by simply playing the instrument considered. Sound on the other hand is rather harder to quantify because different people have varying opinions on what constitutes a great sounding guitar. Here you must use your own personal taste barometer and determine if a particular guitar sounds good enough to handle multiple journeys or whether it will quickly become jarring due to cutting highs or a tone too muddy to enjoy for long periods of time. There is nothing worse that being on a journey and realizing the guitar you’ve taken with you doesn’t conjure up any inspiration, is boring or simply sounds awful. As with the purchase of any guitar, budget should be the main consideration. There is no point buying a guitar you cannot afford. The guilt of overspending eventually outweighs any sense of enjoyment you may get out of an instrument you’ve spent an arm and a leg to get. Common sense dictates that most people wouldn’t do this in the first place, returning us to the point of budget as the guiding light. Don’t let budget spoil your fun though, as there are a number of seemingly budget models that pack quite a bunch and stand proudly next to more expensive travel guitars in terms of sound quality and build. It’s a case of maximizing every dollar spent through good research, patience and an eye for a good deal. Pay as much as you can without getting yourself into debt and you will be happy with your purchase. Though given the function of a travel guitar and its role as a cheap and cheerful alternative to a regular instrument, we wouldn’t recommend spending more than a few hundred dollars. This will give you peace of mind if it happens to get damaged beyond repair or lost during your travels. We recommend that you buy a travel guitar only if you are going to use it for travel. Buying a travel guitar as a main guitar is often a bad idea because it won’t match the quality and sound of regular version. Full-sized guitars are that way for a reason and a travel guitar is no match for the expertise put into constructing these legendary instruments. We also recommend going for mini-acoustic or proper shorter scale models if buying for a child or for someone with smaller hands. These are designed specifically for these types of needs and do far better at catering to them than travel guitars. Conversely, purpose built smaller guitars do not do well during travel so don’t make the mistake of getting one when what you really need is a travel guitar. Also don’t expect more than what is realistically possible with a travel guitar. Set your expectations accordingly and understand the true purpose of a travel guitar as a robust and reliable guitar that sounds decent and is well built. Too many people buy a travel guitar for the cute size only to be very disappointed when they were expecting much more. A low price comes with the territory of a travel guitar unless you venture into more professional models that are geared towards established musicians who want something for performances and recording. For the common guitarist or beginner, we recommend budget travel guitars and among these the Martin Steel String Backpacker Travel Guitar caught out eye. Made by C.F. Martin and Company, a manufacturer that specializes in what are considered some of best acoustic guitars in the world and has done so for the better part of two centuries, the acoustic Backpacker sees Martin pack as much quality as possible at a very affordable price. The guitar itself presents itself with an unusual shape that resembles a paddle or oar, greatly reducing the size of the body. It may take a little time to acclimatize to, but once you’ve played it you realize just how similar it feels to a regular-sized guitar. It seems Martin have tried to find a happy medium between size, comfort and playability, and they seem to have struck gold. 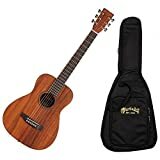 Not only is the Backpacker a head turner that should send a few curious guitarists your way eager to know more about the guitar, it is also well-built with a spruce top and mahogany back and sides. The neck is also mahogany with a rosewood fretboard. These are woods usually found in much more expensive guitars, notably mahogany. At the price, the choice of woods is one of the key attributes of the backpacker. The scale is 24 inches so nothing to0 small and offers 15 frets to play with, a reasonable amount considering the size of the guitar. The neck is nicely rounded for comfort and it is hard not to like the way it feels as the hand glides effortlessly up and down. The action is perfectly low and strings are easily manipulated when playing. We cannot praise the Backpacker enough for the attention to details like these and the overall build feels extremely resilient and well put together. In terms of hardware, this is where Martin have made cost-effective decisions that though somewhat affect the overall quality, allow it to be sold at such a competitive price. We have a standard bridge that uses pins to secure the strings and a set of six of standard machine heads that keep it in tune for long periods. These aren’t the best components by any stretch of the imagination and this doesn’t really matter here because they perform exceptionally well especially in terms of the intonation. Given the design of the guitar, finding a reliable intonation solution must have been a nightmare, but Martin have well and truly delivered. Reliability is the main concern here and the components are up to the task. Now, onto the question of sound. The Backpacker offers quite a sonic punch for the size and this with surprising sustain and carry for the size. The tone covers all the bases with an emphasis on the treble notes. This is partly due to the size of the guitar and is something that gives it character rather than a jarring niggle that worsens over time. Overall, we have a unique looking and great sounding travel guitar by one of the masters of acoustic guitar making. There are not many negative points to raise when considering the Backpacker and it comes highly recommended from us. Another model that stood out for us was the Gretsch G9500 Jim Dandy Flat Top. Gretsch, like Martin, have a rich history and a cemented position among the top manufacturers out there so we can rely on them to provide a quality instrument and this is indeed the case with the Jim Dandy. It stands out for the unique tone it produces, which is less top heavy compared to other travel guitars. The Jim Dandy adopts a classic guitar look without any fancy new shape or design. It is constructed with a resonant agathis body, nato neck and rosewood fretboard. An uncommon mix that seems to work well here. We have 18 frets to play with, which is generous for a travel guitar and the neck feels very comfortable thanks to the c shape it offers. Many cosmetic details adorn the Jim Dandy such as the classy white pickguard and the large inlays creating a really attractive overall look. The dark sunburst coloration also adds to this effect. The bridge is standard issue, as are the tuners, but they do a good job at limiting fret-buzz and keeping the strings tightly in tune. The combination feels solid and performs as expected. The price limits how much a manufacturer can spend on components, but Gretsch have chosen options that are reliably good for the price. Sound wise, the Jim Dandy sounds like a Gretsch, which is in itself a compliment. The natural twangy-ness is lovely to the ears and the spectrum of frequencies is precise, smoothed and clear with an emphasis on the mid-range, unusual for travel guitars. The guitar has a very blues feel thanks to this and can be quite expressive when pushed. It is punchy rather than muddled. Overall, a travel guitar that looks like a regular guitar and plays like one. It is slightly larger than some other models, but quality does sometimes come at a cost to size. We can’t mention budget models without a section covering a Yamaha model given their reputation as the go to manufacturer for the perfect balance of budget and quality for many instrument like pianos as well as guitars. Among their range, we found the Yamaha JR1 to be the most suited to the needs of the travelling musician. The JR1 is Yamaha’s successful attempt at an entry-level travel guitar that plays well and is well constructed without any bells and whistles. It is functional and to the point, something we find to be particularly apt when considering a travel guitar. The JR1 sports a classic dreadnought body shape with a ¾ scale size ideal for travel. We have a spruce top, side and back made of meranti, nato neck and, unsurprisingly, a rosewood fretboard for good measure. The neck is noteworthy given how great it feels to hold, the small size of the rest of the guitar adding to that sense of control and comfort. The JR1 appears uninspiring, almost dull-looking, but don’t be fooled it is a beast in terms of reliability. Components are simplicity personified with a run of the mill bridge and standard machine heads that simply work without any special features or embellishments. 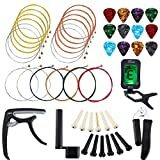 These parts aren’t bad, they are functional and do what they are supposed to do, which is keep the guitar in tune for long periods of time. The guitar has strong build quality for the price and you get a sense that it could take a fair amount of beating before it even showed any signs of wear and tear. As with the rest of the guitar, the sound is to the point with a nice balance of frequencies, with rich lows, punchy mid-range and precise highs. The volume level adheres to the standards expected of travel guitars with a little more on top. It sounds louder than many similarly built and priced alternatives. We rate the JR1 highly. It isn’t for a guitarist that wants something flashy to show off with. It is for the pragmatic player, who wants a solution that he can rely on and trust to get the job done day after day. It isn’t remarkable in any way except in how simple it is. We see it as a guitar you won’t mind losing to an airport luggage department, but will happily be reunited with if it does turn up. Finally, we must mention the Fender MA-1 as our last pick among budget models. Fender carries many connotations of which quality and historically great guitars are the most well known. Here, the MA-1 follows that rich traditional with a ¾ size acoustic guitar that is both a travel guitar and an instrument geared towards players with smaller hands and beginners. Finding a real Fender at a low price is a feat in itself, and anyone would be proud, and reassured, to carry along a guitar carrying that name throughout their travels. As mentioned the scale is ¾ length so significantly smaller than a regular guitar, an ideal size that meets many travel industry luggage requirements. The MA-1 has a petite body made with an agathis top, back and sides made sapele, a neck built with nato and a standard rosewood fretboard. A rather unusual selection of tonewoods that differs from the norm. The bracing is worth mentioning and helps give the guitar a tone similar to that found on steel string dreadnought guitars. This is how Fender have managed to keep the price down without running the risk of offering a sub par instrument and sullying their name. The build is solid and it plays well due to the thin c shaped neck that sports 18 frets. The small size doesn’t affect how well it plays, on the contrary it is reminiscent of the smooth neck found on normal Fender models. The components incorporate a standard bridge and machine heads that do the job of keeping everything in tune with comfortable action and well-tuned intonation. The Fender logo on the head is also a nice touch and should turn a few heads during your travels. Fortunately, the small size doesn’t affect the tone too much and it is hard not to hear a regular Fender playing when strumming chords or noodling around. The sound is balanced with a precise spread of all frequencies, with an emphasis on smooth mids. The carry and presence of the MA-1 is good for the size and remains in keeping with expectations levied at travel guitars. Our final word on the MA-1 is that it’s a wonderful travel guitar that benefits from Fender craftsmanship and expertise. It feels great to play and even comes with a gig bag to avoid scratching it up during journeys. It is very easy to overspend when buying a guitar, particular a travel guitar because numerous manufacturers have extremely competent marketing departments who will do anything possible to sell you something that isn’t necessarily fit for the purpose of voyaging abroad. We have therefore rounded up a list of the best travel guitars with an affordable price, on the cusp being too expensive to risk taking with you. We’ve found these to be good enough to warrant the price, but not too pricey to bother being too distraught over if they are lost or destroyed. Our first pick in this category is the Traveler Guitar AG-200EQ made by the eponymous manufacturer Traveler Guitar. These guys specialize in travel guitars and have been doing so for the past two decades. Their motto is to find a balance between quality, utility and compactness, and they have hit the mark with the AG-200EQ. The guitar sports a full-size 25.50 inch length housed within a smaller frame than expected. This means you feel like you are playing a normal guitar that is strangely smaller. An odd mix to get accustomed to and one that quickly shows its benefits. The dreadnought shaped body is made of a spruce top and mahogany back and sides. The neck is also mahogany and the fretboard is an usual ebonized rosewood. The neck is particularly noteworthy for the smooth feel and 20 frets, a very large number if you take into account it is a travel guitar. This is another attribute of Traveler Guitar and they ability to expertly incorporate as much as possible without it feeling jumbled or busy. Furthermore, the bracing under the top is designed to output a louder volume and this is truly the case as the AG belts louder than any rival model. The overall build screams quality and you inherently feel that time and thought have been invested into making sure this the case. The AG-200EQ also looks the part with a satisfying all black finish. The components include Traveler’s signature Streamline tuning system which places the tuners on the bottom of the body. The tuners resemble rotating knobs rather than machine heads and they do a precise job keeping the guitar in tune. This is a novel system that saves space by removing the need for a headstock and is a breeze to use. The AG has a purpose built bridge that guides the strings down to the Streamline onto which the strings are fixed. Beyond these standard elements, the AG also offers something different and entirely novel for travel guitars; an inbuilt pickup and headphone preamp, called the Shadow NanoFlex. It is essentially a personal amplification solution that also incorporates a tuner, a headphone input, as well as a three way equalizer and an aux-in input so you can plug in your phone or music device and jam along to your favourite tracks. There isn’t much to critic head as the AG-200EQ’s tone is akin to that of an acoustic at a reduced volume level. The tonewood used is responsible for this feat and you will be stunned by the clean and precise array of frequencies in all ranges, though it lacks a little power in the low end as expected with travel guitars. When the Shadow preamp is fired up it sounds good and could easily be ported to a PA system for live gigs. The equalizer is also responsive and manages the sound well based on how you dial the knobs. Overall, we are very impressed with the AG for its innovative features and great sound. It also ships with a robust gig bag that will keep it safe during long journeys. Now, we will cover another travel guitar that jumped out us. However, we preface this with the caveat that his model is rather pricey and may not be within the budget of many buyers. In addition, the cost and quality may make some sheepish about taking it on journey, so we have added it as a novelty more than a serious consideration for travel. It is the Martin LXK2. The tone is well balanced and defined offering a degree of low end that other travel guitarx simply can’t match, a feat given its small size. As with all the models above, it doesn’t beat the power of a full acoustic, but then this is expected. 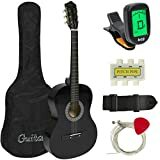 Overall, it sounds better than any model listed in this guide, but the cost is prohibitive and affects its portability due to fear of damaging a very nice guitar. While we are covering Traveller Guitars, it is worth mentioning the AG-200EQ little brother, the Traveler Guitar Ultra-Light. It is essentially a smaller, lighter electric version that looks veritably bizarre with its unique looks that resembles a kind of reverse headstock and neck that has been miniaturized. Do not let the peculiar look fool you, the guitar is quality through and through, standing as a lower cost alternative, though more expensive than our budget picks. The Ultra-Light is tiny, standing tall at 28 inches in total, but with a full 24 inch scale that sports the same playing space as a normal guitar. It’s small enough to be taken on a plane as cabin luggage, avoiding the hassle of checking bags in. A true boon for travelling guitarists. The odd shaped body is made of a single piece of carved out eastern American maple. The neck is carved from the same piece of maple, attached to which is a rosewood fretboard with an astonishing 22 frets. The tiny solid body may have some people wondering how it feels to play and the answer is comfortable given that Traveler have incorporated a detachable lap rest frame that attaches easily and securely to the body. Overall the build feels strong thanks to the one piece maple cut. It is as if you are holding a through-neck regular guitar, which can cost thousands of dollars. The Ultra is also very light, as the name suggests, weighing in at a feather-like two pounds and fourteen ounces. The components are a marvel of innovation. The headstock doesn’t exist and the machine heads are incorporated into the body of the guitar via open rounded openings on either side of the strings. They are not only discreet and won’t affect your playing, they are very precise and responsive. The saddle is truly unique because it acts as a fixture for the strings as well as a pickup, dubbed the under-saddle Shadow Piezo Pickup. Next to the pickup is also a normal jack output that also acts as a strap hold (Traveler wow us once again with this functional use of a core component). Without amplification the Ultra-Light can be described as similar to that of an unplugged electric, so you hear the natural sound of the strings at a low volume. Amplified it comes to life with a lovely tone rich with brightness covering all frequencies. It is also particularly sensitive to amp equalizer settings making it easy to shape the tone to what is required. Overall, we are impressed with the Ultra-Light and recommend it as the perfect electric guitar fit for travel. The attention to detail and problem solving is staggering. It also comes with its own padded gig bag. Which is a very welcome addition given that you wouldn’t be able to find one suited to its shape elsewhere, except if you opted to have one made bespoke at great cost. Among electric travel guitars, we must also shout out the Yamaha SLG200S as a safer alternative to the Ultra-Light. It is Yamaha made so trustworthy and offers the same idea of a silent acoustic, but powerful electric solution. Amplified it creates a rich tone reminiscent of an acoustic, though lacking the low end as expected given there is no natural sound cavity for the sound to reverberate within. It looks amazing and is fairly robust though we recommend taking good care of it with an appropriate hard case. The pickup and preamp incorporate a tuner, three band equalizer and a novel set of effects that can be fed into the guitar’s sound. Overall, a good electric travel guitar that is worth the cost and won’t disappoint if you want something different to the Ultra-Light.